Those of you who have ordered custom shirts from me, and those of you who have considered it know that there is a huge range of options: fabric, collar length and spread, pockets, cuff style and buttons can all be customized. New this Fall my shirt manufacturer has begun offering even more choices including: a rounded one-button cuff that is longer on the outside of the wrist; epaulettes and yoke tabs for shoulder details; American roll button down collars; contrast pick stitch on buttonholes, collars or cuffs; and lastly kids shirts. 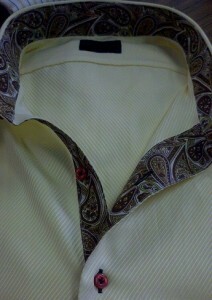 Additionally, many unique contrast fabrics are available for a “Robert Talbott” style shirt with collar and cuff detail. 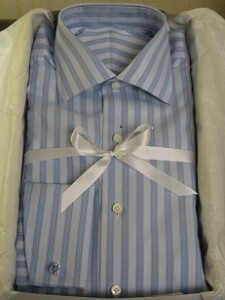 And if you really want to customize your shirt we can include your actual signature or initials as your personal monogram; it will appear exactly as you sign your name – now that’s personalization! Please know that, like most of what I sell, these shirts are Made in America, so even if you go for a basic white buttondown style, you will be supporting the good old USA.